An aspiring actress takes on her dream role of staring in a series of corporate training seminars! Except it’s not her dream role, for obvious reasons, it’s just the only paid acting job Audrey (Claire Armstrong) can find. She takes on this laughable role with aspiring playwright Lillian (Naomi Skwarna) and the two women make the best of the situation, using it as a creative outlet and a jumping point to try and further their careers. Dim the Fluorescents is director Daniel Warth’s debut feature film, and he shows loads of promise with his unique style and confidence. Armstrong gives a fantastic, intriguing and hilarious performance as she navigates the harsh realities of life, her mental health and going to a variety of auditions to make her dreams come true. The main downfall of this film was that it was trying to do to much at once inside of focusing on its smart concept and the complicated friendship between Audrey and Lillian. This film has a lot of weird, crazy and kind of funny side plots that do add a bit charm, but overall don’t aid the storytelling. However, even though the film lacks in consistency, it does have a lot of redeemable qualities. 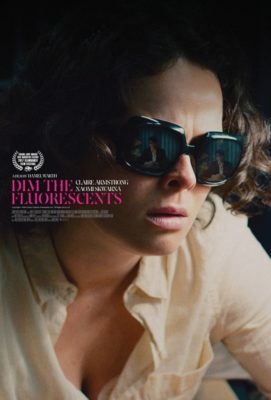 Dim the Fluorescents will keep you on the edge of your seat and have you laughing for a good majority of the runtime.